Man in nature. Harmony and romance. 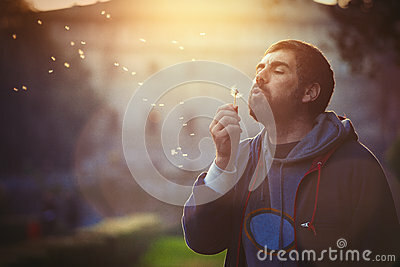 A bearded man is blowing a dandelion flower in a natural park at sunset. Hot scene with sunbeams. Concept of touch with nature, respect for it, falling in love and freedom. The tower of stones on the beach. Yoga vrikshasana tree pose by woman in silhouette on the beach with sunset sky background. Free space for text.